a gesamten in modern German. 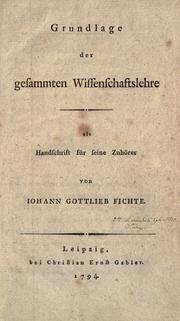 Foundations of the Science of Knowledge (German: Grundlage der gesammten Wissenschaftslehre) is a 1794/1795 book by the German philosopher Johann Gottlieb Fichte. Based on lectures Fichte had delivered as a Professor of Philosophy at the University of Jena, it was later reworked in various versions. The standard Wissenschaftslehre was published in 1804, but other versions appeared posthumously. In 1798, the German romantic Friedrich Schlegel identified the Wissenschaftslehre, together with the French revolution and Johann Wolfgang von Goethe's Wilhelm Meister, as "the most important trend-setting events (Tendenzen) of the age." Michael Inwood believes that the work is close in spirit to the early works of Edmund Husserl, including the Ideas (1913) and the Cartesian Meditations (1931). The Wissenschaftslehre has been described by Roger Scruton as being both "immensely difficult" and "rough-hewn and uncouth". 1 2 Scruton 2000. p. 208. ↑ Seidel 1993. p. 1. ↑ Inwood 2005. p. 410. Inwood, M. J. (2005). Honderich, Ted, ed. The Oxford Companion to Philosophy. Oxford: Oxford University Press. ISBN 0-19-926479-1. Scruton, Roger (2000). Kenny, Anthony, ed. The Oxford History of Western Philosophy. Oxford: Oxford University Press. ISBN 0-19-289329-7. Seidel, George J. (1993). Fichte's Wissenschaftslehre of 1794. Purdue University Research Foundation: Purdue University Press. ISBN 1-55753-017-3.